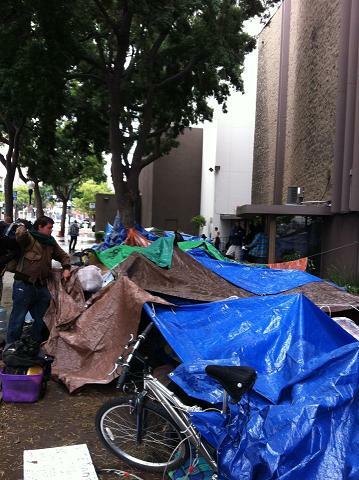 Occupy San Diego – One Month Old Today – What Has It Wrought? Now today Occupy San Diego is one month old! The first large march and encampment occurred on Friday, October 7th. The very next day, occupiers then moved over to the Civic Center Plaza where they’ve been ever since. For one month now Occupy San Diego has joined the rest of the world in using a tactic begun by Egyptian protesters at the beginning of the “Arab Spring” – occupying public space to draw attention to demands to changes in the social and economic system. It has brought a local manifestation of the nation-wide Occupy Wall Street movement to San Diego – brought it here to our little town and created something close-up. OSD is where the politicized and energized youth of San Diego found expression and created a political framework of their own. It created a new type of political demonstration that defies all previous forms – right at City Hall – right in the face of San Diego’s power elite. Through its weekly actions OccupySD has placed the focus on the banks as being the central fault or reason for the financial collapse of the country. OSD created a space for political imagination and expression against the corporate control of our city / society. It created a “small village” at the Plaza for awhile, creating space for the development and exercise of alternative relationships. The “village” had a kitchen and free food line, a medical tent, 2 libraries, a comfort station, a media tent, an arts and crafts station, etc. It has provided space and sites for teach-in’s and educational learning sessions. 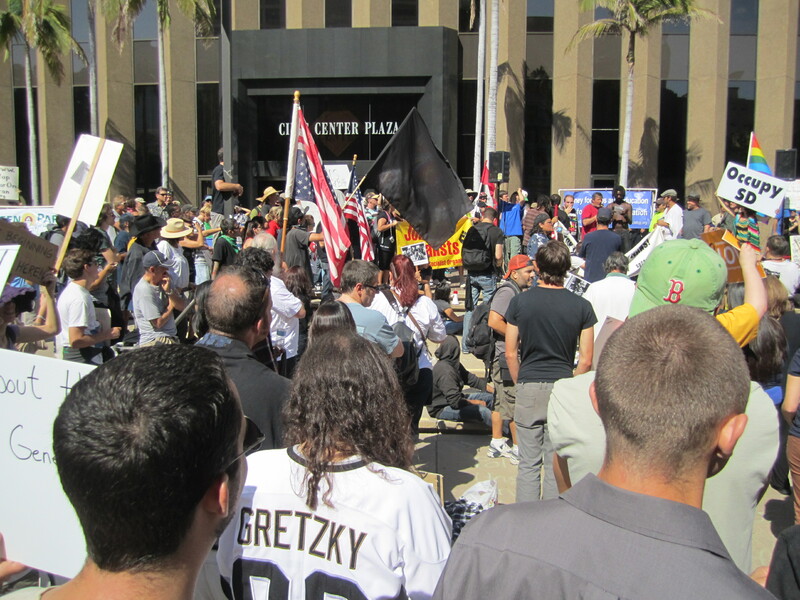 OccupySD fed the homeless in downtown San Diego – a criminal act in the eyes of some – and provided space and safety for many, providing other social services to them. Occupy San Diego has confronted the City of San Diego, the Mayor and the police on antiquated and anti-homeless laws used against protesters trying to utilize their rights to free expression and assembly. It has definitely changed the local dialog and discussion here in San Diego, giving the local corporate media something to ignore, make fun of and use to help sell papers and gain viewers. It has provided daily visible political actions in downtown San Diego. OSD has provided a space/ site/ forum and focus for other San Diego progressives, such as the labor council and peace and justice activists about the economy and wars. Occupy San Diego has brought together many disparate activists of different causes into one organizational framework. 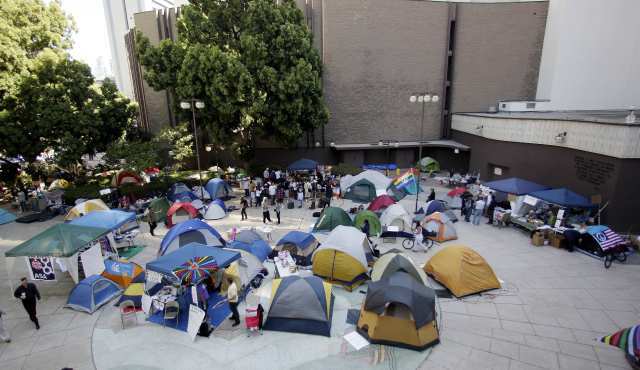 And most importantly, Occupy San Diego has survived and is still there! And all this in just one month. STAND STRONG OCCUPY SD…WE ARE THE 99%! This is what Democracy Looks Like! Doubt very much that is what the real Cesar Chavez would have said, and in fact you are desecrating his name by using it this way. Chavez well understood the value of non-violent civil disobedience and non-traditional forms of protest. We need to find more ways to reach people who aren’t Online! There need to be fliers that announce OSD’s projected actions at every major intersection, campus, library, senior and low-income housing sites, et al. Many people, the people who most need to be reached, are not Online. It’s great that the movement started mainly with youth who could communicate the message on social networking sites, but now the need to find creative old-fashioned ways to communicate to others must be found. I wish there were a dozen OB Rag-style newspapers in every region as big as SD County. To communicate to the broader public, without the major media distortion filter, it might be a fruitful idea for Occupy SD and others to start newsletters, real and virtual. Something else besides the major media and the internet is required. I know several people who go to the library to use the net, and that is an infrequent opportunity in this corrupt city nowadays: nearly all libraries are only open for 4 days a week, very limited hours, with a few hours on Saturday barely counting. Most libraries have a very long waiting line for the computers, and working people don’t usually get on at the beginning or end of the meager library-internet window of opportunity. First, you have apparently brought nothing to the table in terms of constructive dialog or ideas to address the problem. Can you even clearly define the problem? As a result, no governmental or corporate entity has been motivated to engage even in serious discussion, much less change. Remember, the purpose of activism is to accomplish change, not to stroke each others’ egos about being activists. Second, it appears that the group is far, far from representative of “the 99%”. There are approximately three million residents of San Diego County. We are one of the most culturally and socio-economically diverse places in the country. Now look around at the number and cultural makeup of the activists downtown. Representative? I hardly think so. Community organization is a requisite skill for activism. If the goal is really to motivate change and not just to get your time in the limelight, then you need to get your own house in order, first. Until you do, you will not get the significant groundswell of support from the community that you need, nor will you get the serious consideration of the establishment that is the point of this all. And i disagree with you. The accomplishments listed are real and demonstrable . Your characterizing them as self serving was simply wrong and i think you would agree was a way for you to inject a little snarkiness. I have come notice that the posts that are critical of the occupation movement are usually condescending, a quality i strongly associate with the 1%. as far as not representing the 99% again i have disagree. in fact i would suggest that you missed the point. the 99% are defined by the economic realities of wealth distribution. Since that covers almost all of our diverse population and has had great consequences on the living standard of most , all of us represent the 99% And when any one of us speaks out from their own condition represent the conditions of most of us. why do you question the motivations of those who seek change. if one seeks the limelight there are plenty of other venues that are offer greater opportunities with a lot less sacrifice. But I think the whole limelight business fits the tone of your post, cynical . I find it interesting that that you are critical from the point of view of an activist, yet I doubt that you are one. An activist would know that that change and progress are a long hard slog. it is the purpose of activist to accomplish change. Summing up recent victories, even the small ones, is important for morale and encouraging. If you were an activist you would have to be very excited by what has transpired over the last month.If you were truly an activist and were critical, your suggestions would be kindly and helpful, and most importantly, honest. finally, we are always getting our house in order. we struggle daily over philosophies, ethics, tactics, and strategy. we call it democracy . Oh ,and if you check out the over 1500 occupations that have sprung up nation wide and checked recent polls, you notice we have already got the groundswell of support you seemed to have missed. So you can remove that complaint. You might also want to google press stories about the occupation movements over the past four weeks. You might want to set aside a large block of time as there is a lot of reading material to get through. You will no longer to to concern yourself whether or not weve gotten the serious consideration of the establishment. Dave I daresay your excessively angrys sounding reply reveals he may be on more solid ground than you’d like to admit, even to yourself. I like and respect Frank and hope this is him repeatiung their talking points and not of his origins, (the prior likely as he’s reporting, not editorializing, right? )but if I have to get under his skin with it so be it. That is hardly the case at all. The bad mortgage funds, they were not the cause of the bad economy. Corporate bailouts were not the cause of the bad economy… those things are merely symptoms, effects of the bad economy. Wall St. greed and avarice were NOT the cause of the bad economy. They were only bared to light by the bad economy leaving so little to go around their standard practices were too obvious to continue to ignore. The BAD economy is a few things, #1 the prosperity since WW2, further buoyed by us establishing dollar hegemony world wide through military led imperialism protecting our petroleum exporters and cold war partners, was all inflated and false. We printed money and traded it for real goods, resources etc and the middle east propped it up with black gold. We weren’t working harder and smarter, we had the gold and made the rules. We’re losing this, it could not go on forever. Second and more important, the end of the cold war happened at the same time information and communications technology took off- and our government foolishly partnered with China’s industry while fighting for their human rights. American corporations leaped at the chance to close US factories, teach the Chinese how to make what we were making, and they took that knowledge and ran like hell with it. Asian manufacturing prowess advanced in 10 years what had taken many decades in America. Computers and the internet sealed the deal, 1.3 billion people had everything we knew at the touch of their fingers and had complete contempt for our copyrights, patents, everything once protected. By the early 00’s the US economy had completely transformed into what I have termed the “Cannibal Economy”- factories closed, a Walmart sprang up across the street- and we’ve been feeding off what was left of ourselves ever since, now there’s just gristle and bone. We are in fact all to blame, every American in some respect. We all wanted cheap DVD players, new TV’s, shiny toys at Christmas. Everyone working in a factory wanted their kid in college and a big house and went on strike if it wasn’t on the horizon. We wanted clean air and water, when we got it we decided we didn’t want to look at the dirty factory and its smokestacks either. We couldn’t bear knowing our t shirts were made in sweatshops. We couldn’t stand chinese tanks running over their people. Global socialists partnered (unwittingly) with capitalist greed, believe it or not, is what robbed young americans of the opportunity their parents had. You know why the “establishment ” you’re tryng to thumb your noses at is chuckling at all this? Well let’s see, the main movement is people upset that they have lost opportunities, that their oyster has no pearl in it. America is robbed, it’s mother hubbard’s cupboard. But you’re blaming Wall St., who always furnished the capital for that. And surrounding yourselves with greens, war protestors, global socialists, just about everyone who has worked against America’s prosperity for decades. Anyway…. Bless the lot of ya for pointing out the excessive greed going on, but I gotta tell ya it sure looked silly. If ya figured out yer asses from a hole in the ground you might be dangerous. Yes, John, it was my own analysis and observations. Although I agree with you on some points, such as “buoyed by us establishing dollar hegemony world wide through military led imperialism protecting our petroleum exporters and cold war partners, was all inflated and false,” the rest of your response is off center. You usual comments are well-thought out but here they lack the candor of a genuine critique of capitalist imperialism. But at least you’re thinking. Well if anyone was ever in full agreement with one of the bags of hot air I float here it would indeed be pretty creepy. If you like I’d condense that down to stating what’s different now vs 20 or 40 years ago is we have little real industry producing things Americans OR the world are purchasing, and lost those good paying jobs that paid mortgages and they aren’t coming back unless we want to live and pollute like the chinese. Ingenuity won’t cut it because they ignore patents and copyrights. Wall Street has no industries to pump new dollars into so will continue to skim off the selling of America’s assets. In a word, grim. The phrase was meant as both criticism and compliment, and was meant for a wider audience than just you. Forgive me if it seemed all directed at you. What do you think will happen when the US dollar collapses as the world reserve currency? at this time and for the last well I’m not sure how long it has been counterfeit. You can’t just keep making $ and except the world the except it. We have no national product to back it…. I think the protest is a little to late and most down there don’t know what the real problem is. I was slammed not to long ago and called a Conspiracy theorist, well maybe so, but when our dollar collapses in the world what do you think will happen? at this point it’s called inherent denial by most in the US… this can’t happen to us…yea right. I like all these people coming out of the woodwork with their pet obsessions and theories, half-smart, and arrogantly asserting that Occupy protestors don’t know what the Real Problems are, like they do. Too much! (or as the above poster would write: “to much”!) . . . Reminds me of Ron Paul’s statement about OWS, when asked if he approves of their sentiments: It’ll be fine as long as they ultimately agree with all of my views on the matter. Or words to that effect. As Allen Lewis does know exactly what he’s talking about, if you’re criticizing his opinions (or mine, not sure) it would be more credible to point out their flaws instead of mocking them. A problem many see with OWS is if you are proposing tearing down an institution you had better have a cohesive plan for a workable replacement, or it’s going to be seen as just useless complaining. As for Ron Paul well his ideas seem great until you spend more than a minute listening to him and consider the result of implementing them. Unrealistic and surely disastrous even if you could do them, most cannot. He is simply telling people what they want to hear. Allen Lewis,L didn’t bother reading the article you commented on,but, when we are not holding the worlds reserve currency any longer, we can fall back on our gold reserves. After all, most of that gold was bought at $13 an ounce. How much gold do we really have backing our currency?